No more dangerous, tangled cords behind your computers, appliances and entertainment centers! Command Cord Organizers are perfect for work and home offices, as well as entertainment areas, where they keep cords organized and safely out of the way. Command Cord Organizers hold strongly on a variety of surfaces, including paint, wood, tile and more. They also come off cleanly no holes, marks, sticky residue or stains and if you need to re-organize your cords, its as easy as applying a Command Refill Strip, so you can use them again and again! Contains 2 bundlers, 3 strips. Holds up to 2 lbs. 50 Feet All Weather Contractor Grade Multi-Outlet Cord Extra heavy-duty super flexible all-weather thermoplastic elastomer cord, 50 ft. long. 3 outlet power block with lighted connector. Superior resistance to oily, moisture, ozone, cracking and are standing for abuse, rough handling and wear. Outdoor Use, the lighted connector allows to use where the power is on. Tough cord remains flexible up to 221F and down to -58F. Blue/orange cord. 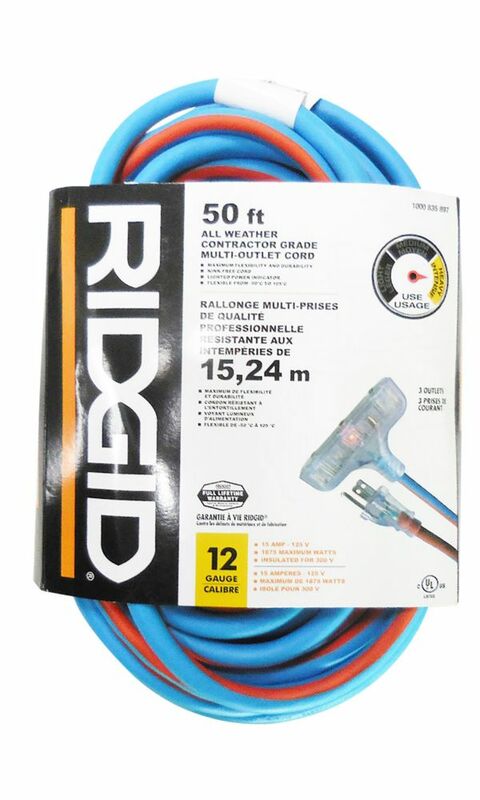 50 Feet All Weather Contractor Grade Multi-Outlet Cord is rated 3.0 out of 5 by 4. Rated 1 out of 5 by David from Cord does not relax in straight line but remains in coiled shape after release from packaging - h... Cord does not relax in straight line but remains in coiled shape after release from packaging - has stayed that way for 2 weeks. Also hard to coil for storage because of rigidity. Rated 1 out of 5 by hunkaburning from Short life One outlet of the three shorted and tripped the GFI while plugged into a block heater. Cleaned it up, marked poor outlet. Never used with a vehicle again. Three uses later, while charging an ATV battery, another outlet started arcing without tripping the GFI. That's it for this cord.